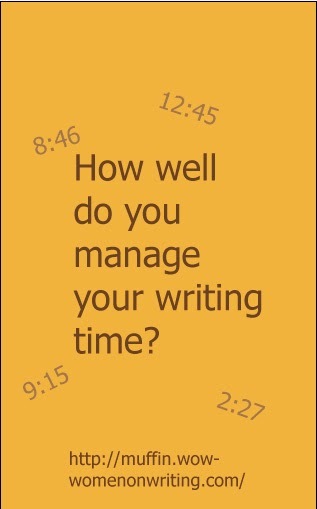 Do you wish that you were a more productive writer? If so, you aren’t alone. Lately, I haven’t been accomplishing as much as I would like. At first, I blamed the fact that I just finished a work-for-hire project -- I researched and wrote a book on the Ancient Maya in five short weeks. Afterwards, I just didn’t accomplish much. That said, I’ve had almost two months to recover, but the results have been unimpressive. With my son off school, too young to drive, and on swim team, I’m not home for long stretches of time. Sometimes I manage two hours. Other days, I scrape together a half hour here and a half hour there. Either way, I’m not getting much done. Then I read about the Pomodoro Technique. This is a time management system based on the kitchen timer. You set the timer for 25 minutes, work throughout that time, and then take a five minute break. Follow this with another 25 minutes of work and another break, and so on. Figure out, accurately, how many Pomodoro (25 minute time periods) a task takes. Work on concentrating, ignoring outside distractions, for one Pomodoro at a time. Block out the time that you need to get a job done. Work these time blocks into the time you actually have available to work. I’m not certain how this is going to work long term but in just a few days, I’ve noticed a drastic increase in my productivity. In part, this is because I’m realistically considering what I can get done in 25 minutes. With this do-able goal in sight, I sit down and write whether I have 30 minutes to work or 2 hours. The ultimate test will take place during the upcoming week with the arrival of Boy Scout Camp. While my swimmer is at camp, my days are free to write. That should be good but with a long stretches of time, I have to be careful not to fritter it away so that I accomplish nothing or push myself too hard, too fast so that I burn out and quit working. Fortunately, the Pomodoro technique also encourages you to take longer breaks every two hours. The thought is that you can put in a productive day if you manage your time and give yourself necessary down time. If you want to learn more about the Pomodoro system, visit their web site or Google Pomodoro Technique. I will check this out. Perhaps in those short breaks I could sweep or do a little exercise? Thanks for letting us know about a new technique for time management. Using short intervals really works for me when writing a novel's draft. It seems less daunting somehow. Good luck with Boy Scout Camp. Here's to getting a bunch done. So far, so good. One blog post, a graphic and 2 book reviews completed today. In addition to touching up the paint in the bathroom, grocery shopping, and weeding. Am thinking this is going to work as long as I have a daily writing goal and don't over-do it. The Pomodoro Technique is great for short term projects. Eventually, though, you may tend to just turn off the timer. For this reason, I recommend saving it for those times you really need to amp up your productivity and focus. Will the Real Me Please Appear on the Page! Friday Speak Out: Reading….Or Writing?